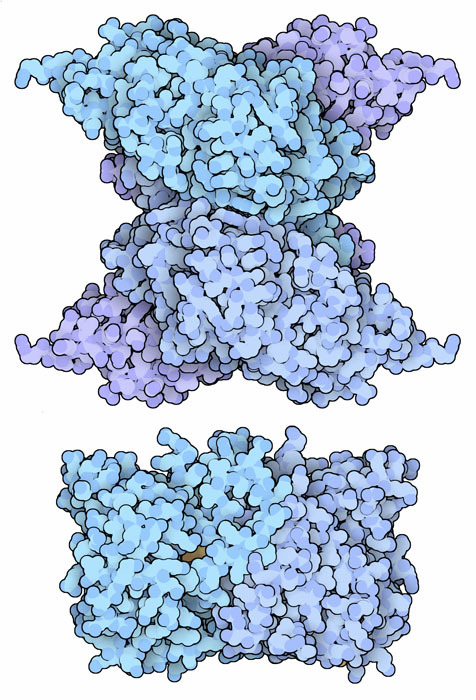 Selenocysteine synthase (top) and selenophosphate synthase (bottom). If you have visited your local health food store or looked closely at the ingredients in your daily multivitamin, you may have noticed that the element selenium is often listed as one of the beneficial supplements. Selenium is a double-edged sword, however. In general, selenium compounds are toxic and have an unpleasant garlicy odor, but in trace amounts, selenium is essential for our health. Selenium atoms are similar to sulfur atoms, with similar properties, except that selenium compounds tend to be more reactive. In a few specialized proteins, this extra reactivity is just what is needed. For instance, by using a selenium atom instead of sulfur, thioredoxin reductase improves its rate of catalysis by 100 times, and formate dehydrogenases act 300 times faster. Proteins contain two types of amino acids with sulfur atoms, and both may be made in versions with selenium atoms. Selenomethionine is not made specifically by cells, but it is created occasionally by accident by the normal enzymes that make methionine. This is not a problem, however, since it is similar enough to normal methionine. It is, however, very useful to crystallographers to help with the determination of x-ray crystal structures, since it has more electrons than sulfur and is easily located in x-ray experiments. Selenocysteine, on the other hand, is more reactive than normal cysteine, and it is specifically added to special selenoproteins when it is needed. Quite surprisingly, cells modify their genetic code to add selenocysteine into their proteins. The basic genetic code used by all organisms on Earth specifies twenty amino acids, along with a few stop codons. In order to add a 21st amino acid to this code, cells reinterpret UGA stop codons in special cases. But this causes a problem: how does a cell know when to read UGA as "stop" and when to read it as "selenocysteine"? This is done by using a special signal sequence that is located after the UGA codon. In bacteria, this signal is immediately after the UGA codon, in the coding portion of the messenger RNA. In our cells, the signal is much further away at the end of the coding sequence. As shown on the next page, this sequence is recognized by a special elongation factor that delivers the selenocysteine tRNA to the ribosome at just the right moment. Since selenium and sulfur are so similar, cells must pay careful attention to how selenocysteine is attached to tRNA. They have to make sure that selenocysteine is not added to normal cysteine tRNA, otherwise selenocysteine might be added mistakenly in the wrong place. To solve this problem, selenocysteine tRNA is made in several steps. First, a serine is attached to the selenocysteine tRNA. Then, a second enzyme phosphorylates the serine, making it ready. Finally, the oxygen in the serine is swapped for selenium by the enzyme selenocysteine synthase, shown here from PDB entry 3bc8 . The small enzyme selenophosphate synthase, shown at the bottom from PDB entry 2yye , creates an activated form of selenium that is needed in this reaction. By using this stepwise process, none of the tRNA-charging enzymes are ever faced with the delicate task of differentiating cysteine from selenocysteine. Elongation factor SelB (left) bound to a short piece of messenger RNA (right). Elongation factor SelB is the protein that decides when to add a selenocysteine at UGA codons instead of stopping. It recognizes a special "selenocysteine insertion sequence" that is found after the UGA codon and forms a distinctive hairpin loop in the messenger RNA. PDB entry 1wb1 , shown on the left, shows the whole protein. 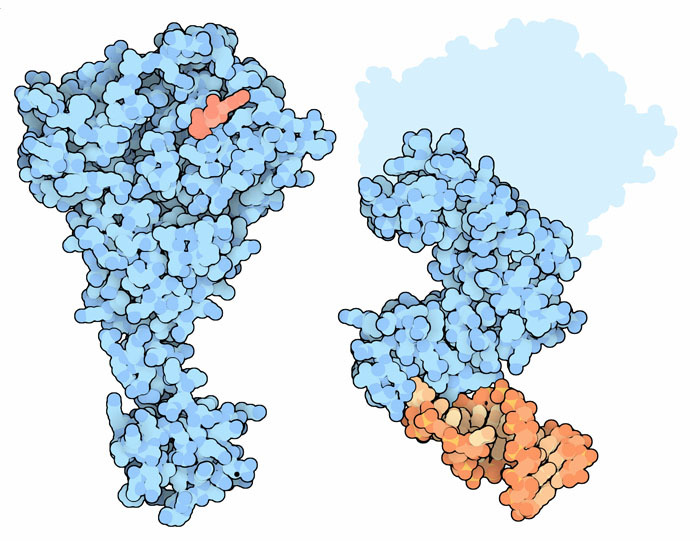 The large portion at the top binds to GTP (shown in orange) and delivers the selenocysteine tRNA to the ribosome. It is similar to elongation factor Tu, which delivers the twenty normal tRNA molecules to the ribosome. This is attached to a flexible tail that binds to the insertion sequence in the messenger RNA. The structure on the right (PDB entry 2uwm ) includes this flexible tail of SelB along with a piece of the messenger RNA (in red and orange). The protein recognizes a guanine base that is flipped out in the loop, along with the overall shape of the hairpin. About 15 selenoproteins have been found in human cells. These include several deiodinase enzymes that are essential for the generation of thyroid hormones, several glutathione peroxidases that are important for the conversion and detoxification of compounds with reactive oxygen atoms, and several proteins of unknown function. The active site of glutathione peroxidase is shown here from PDB entry 1gp1 . 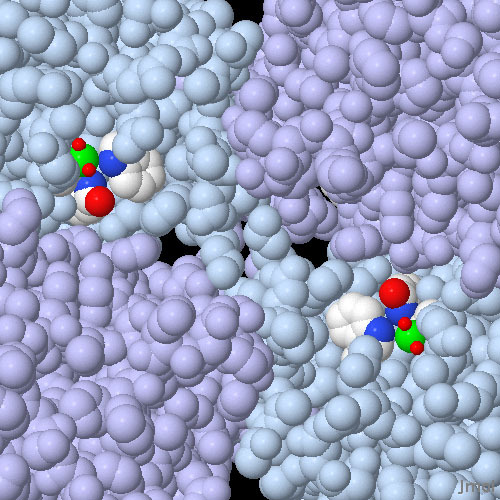 The picture shows two of the four identical active sites in the tetrameric enzyme. Each active site is composed of a selenocysteine amino acid (the selenium atoms are colored green) which is activated by a tryptophan and a glutamine (shown with atomic colors). In this crystal structure, the selenocysteine is highly oxidized, with two oxygen atoms (shown as small red spheres) bound to the selenium. In the normal catalytic cycle of the enzyme, it is thought that the selenium extracts one reactive oxygen from dangerous peroxides, and then uses water and glutathione to neutralize it. This illustration was created with Jmol--you can see an interactive version of the structure by clicking on the image. There are several natural selenoproteins in the PDB, as well as many proteins with selenomethionine residues that were used in the crystallographic structure determination. Can you find some examples? SelB recognizes the special insertion sequence by forming specific contacts with a guanine base in the mRNA loop. Can you identify the amino acids that are important for this recognition? L. A. Wessjohann, A. Schneider, M. Abbas and W. Brandt (2007) Selinium in chemistry and biochemistry in comparison with sulfur. Biological Chemistry 388, 997-1006. S. Gromer, J. K. Eubel, B. L. Lee and J. Jacob (2005) Human selenoproteins at a glance. Cellular and Molecular Life Sciences 62, 2414-2437.